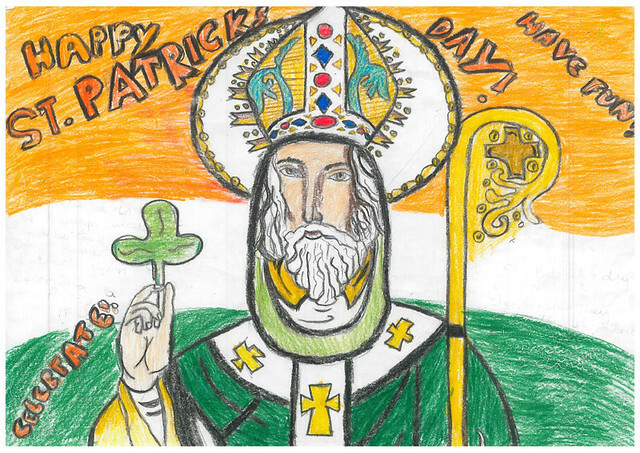 This year, we invited children from London’s primary schools to design a banner for London St Patrick’s Day Parade 2017. Competition was tough as you can imagine. We’d like to thank everyone who took part. There were so many brilliant entries. But as with any competition there can only be one winner. So we’d like to congratulate Casi from St Francesca Cabrini RC primary school. Her entry was picked by the head of our panel of judges, TV presenter Dermot O’ Leary. Eleven other entries were shortlisted. Each will receive a prize of an art materials pack from Cara Stationery. View the gallery below of the winning and shortlisted entries. You’ll also be able to see all 12 finalists on show in a special free exhibition at City Hall, 27 - 30 March. Casi’s artwork will now be made into a banner and she’s been invited to proudly carry it on Sunday’s St Patrick’s Day Parade. Crowds of more than 50,000 people are expected to watch as the parade passes from Piccadilly to Trafalgar Square at midday. With pageantry, floats, marching bands, sports clubs and Irish dancing schools, it’s a sight to behold. The parade is just one of a number of spectacular events taking place for London’s supersized St Patrick’s Festival this weekend. Don’t miss it!